With a damp, clean cloth, wipe out your child’s mouth 15 minutes after each meal – liquid or solid. Doing so keeps their mouth free of sugar and debris that can lead to cavities. 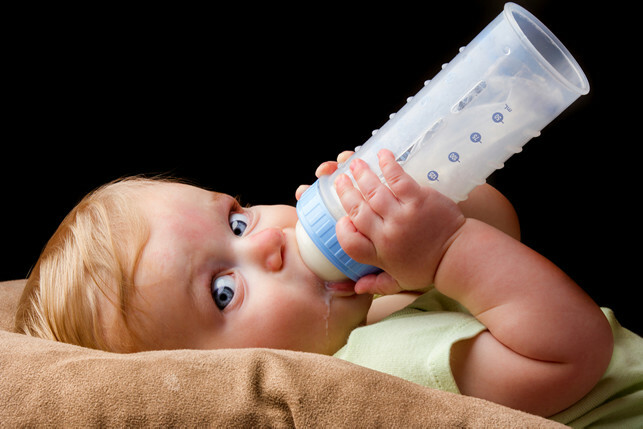 While a bedtime bottle may comfort your infant, it can be very destructive for their gums and developing teeth. When left in your children’s mouth, sugar from breast milk, formula and milk can lead to infection and pain. Try to establish a bedtime routine that doesn’t involve a baby bottle. A good way to get your child off of the bedtime bottle is by giving them a long drink before bedtime. Try to get into a routine that allows them to sip from their bottle while they’re in bed, but under your supervision. Take the bottle with you before turning the lights out and letting them sleep. This sort of routine will get them accustomed to having a drink right before bed, and prevent them from craving a bedtime bottle. The best way to warm bottled formula is in a pot full of water upon the stove. To do this, fill a pot that is tall enough to completely cover their bottle. Warm the pot on a low-medium setting for 4 – 5 minutes. Then, place the bottle in the water and let it heat up for 1 – 2 minutes. Before serving your infant, check the temperature of the formula by putting a dab on the inside of your forearm to make sure that it isn’t too hot. As your child begins walking, they’ll also begin falling, which is why you shouldn’t let newly mobile children walk with their bottle. Did you know that every 4 hours a child in America visits the hospital because a facial injury as a result of falling while holding a bottle? You can avoid this by not giving them a walking around bottle, and having them sit down before they drink.